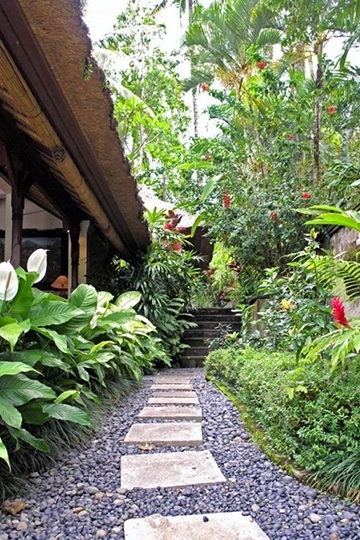 Turning off the newly tarmacked road cutting through a prosperous Balinese village and rolling to a stop at the entrance to Villa Ria Sayan, there’s little indication of what lies beyond the traditional Balinese doors. A few steps across the garden through the front door, its secret is revealed: the sweetest two-storey house and, beyond, heart-racing jaw-dropping views across the Sayan Gorge. 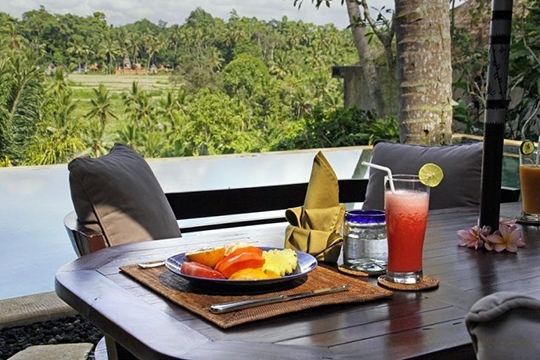 Perched right on the edge of the Sayan ridge high above the Ayung river, Villa Ria Sayan commands 180-degree views of rice terraces, palm trees, a Balinese temple and, in the distance, the sacred mountain range of Batukaru. This is a million-dollar vista, normally the preserve of massive multi-bedroom villas and prohibitively priced five star hotels – in Monopoly terms, you’ve landed on Mayfair! 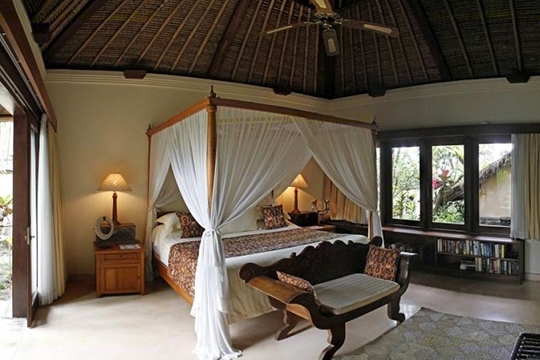 And yet here it is, a verdant carpet unfurling towards the horizon for an exclusive audience of just four villa guests. 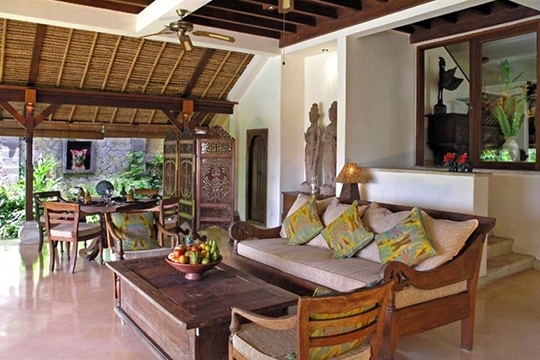 For one of the charms of this villa is its size – just two bedrooms (as rare as hens’ teeth in this upper-crust enclave). 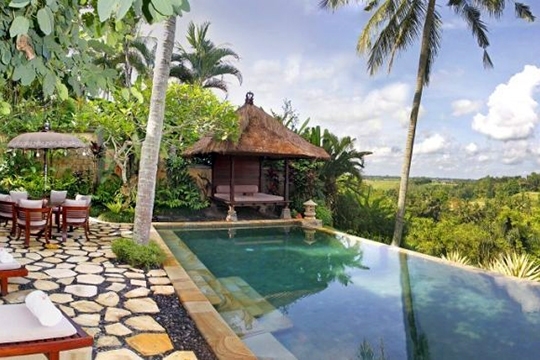 The place was completed in 2000 and has that wonderful laid-back élan that characterises much-coveted ‘Bali style’ architecture – soaring alang-alang (thatched) roof, large open-sided living pavilion, indoor-outdoor bathrooms, and poolside balé (gazebo). 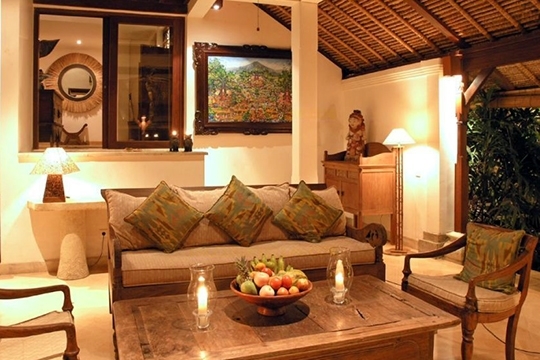 Villa Ria Sayan is clearly a cherished home; the interiors are brimming with handsome furniture, eclectic artefacts and books on Indonesian culture collected by the American owner. And the staff have been here since day one! 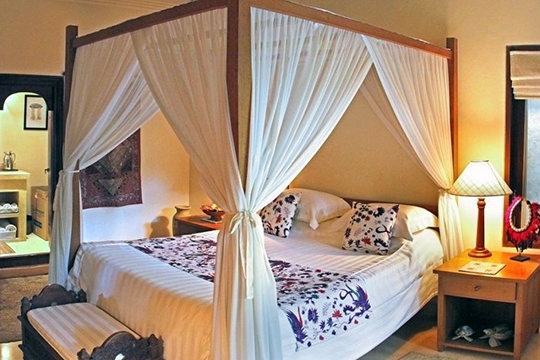 With such comfortable surrounding, it’s easy to stay put, enjoy the serenity and bask in the views and Nengah’s home cooking (groceries charged at cost with a little petrol money). 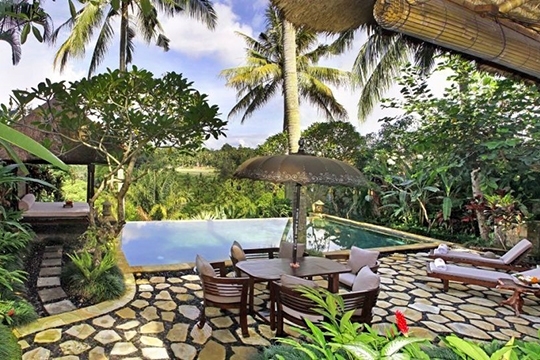 But if you’re compelled to stroll beyond the villa’s boundary, the restaurant at Bambu Indah is a hop and skip away, and a 10-minute drive will take you into Ubud, Bali’s cultural heart. A couple (or two) would feel very much at home here, as would a family with two or three older kids (the upstairs study/TV room has an old opium bed that can be made up for a fifth guest). It’s not a place of state-of-the-art fittings and door-to-door staff standing to attention 24/7. But with a cook, housekeeper and nighttime security, there’s always someone on hand – and if you want to skinny-dip with a dramatic view, you can have the place entirely to yourself whenever you want. 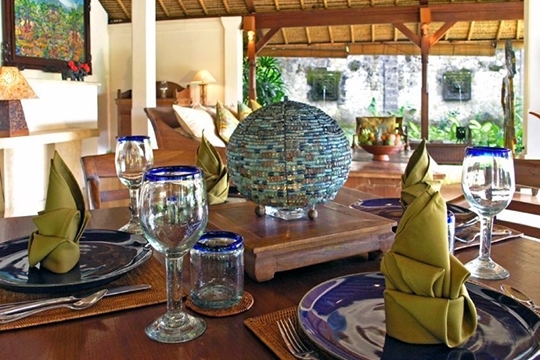 Villa Ria Sayan sits right at the edge of the Sayan Ridge – a vertiginous ringside seat with extraordinary views over the ravine towards emerald rice terraces, swaying palms and a range of volcanoes looming on the horizon. On either side of its high-walled gardens are privately owned residences and, further along the ridge, five-star boutique hotels which put some good restaurants within walking distance. 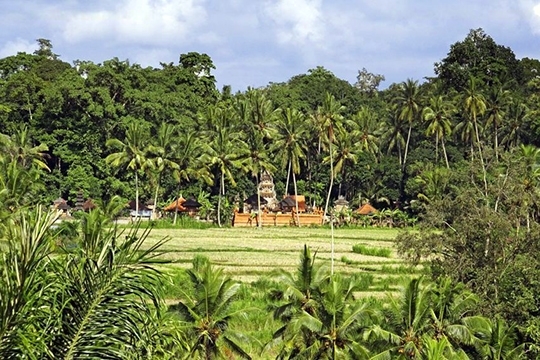 Behind the villa (and out of sight and hearing), the rhythm of village life continues unabated. 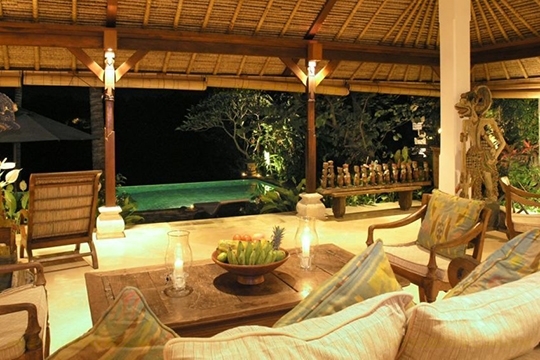 Villa Ria Sayan is set securely within a walled garden breached by a traditional Balinese entrance. 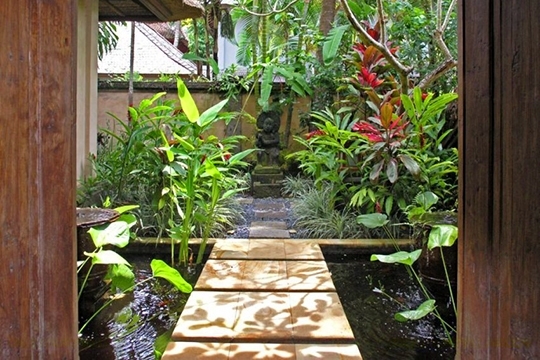 A path leads across a fish pond with flanking fountains in terracotta pots, into a two-storey entrance foyer decorated with an enormous rice chest on which stand striking (and now hard-to-find) artefacts. Teakwood stairs lead to a delightful upper-level room where a large desk is set before floor-to-ceiling windows looking down across the gorge. 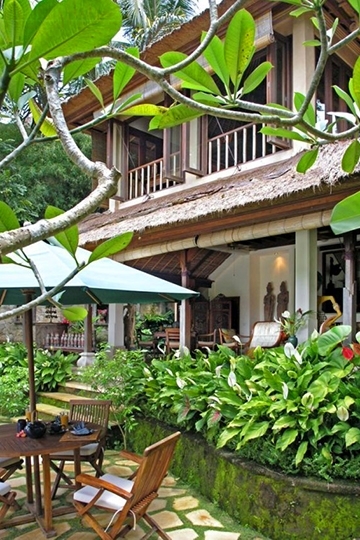 Here, you can sprawl on the antique Javanese daybed and flick through the library of books on Indonesia, listen to music or recline in a water-hyacinth chair and watch a DVD in air-conditioned splendour. 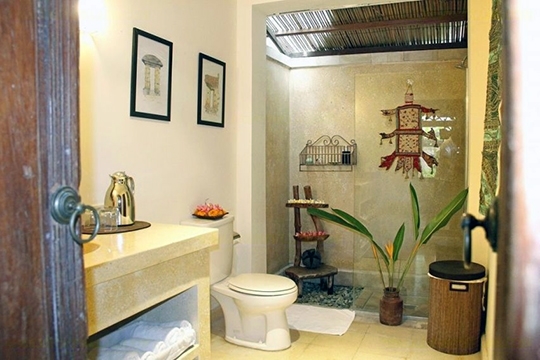 (This room also doubles as an extra one-man bedroom with an adjacent shower room). 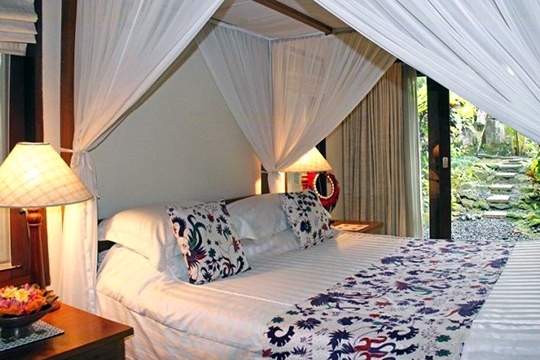 Back downstairs, doors open onto two air-conditioned bedrooms, each with super-king four-poster beds, original Indonesian furniture, and a wall of glazed bi-fold doors opening onto the garden. The master bedroom has an additional walk-in wardrobe and – below windows opening onto the pond – a bookcase brimming with an eclectic range of bestsellers and novels for bedtime reading. 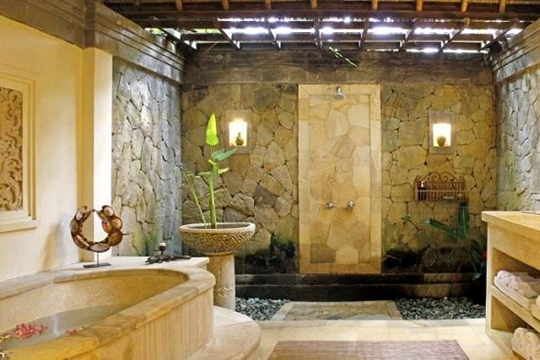 The attached garden-style bathroom has a vanity, bathtub and large semi-open shower, while the second bedroom’s ensuite shower room is also accessed direct from the lobby. 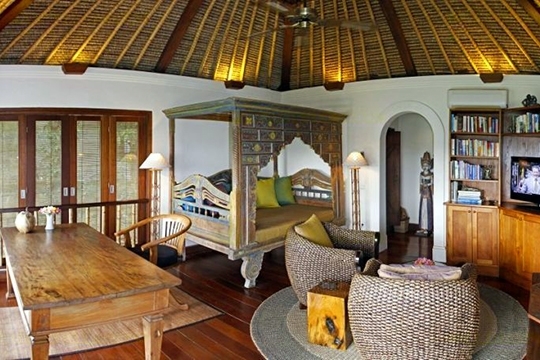 Through glazed doors from the lobby, steps lead into the main living space – a large traditional alang-alang roofed pavilion open to the garden on three sides, with amazing far-reaching views from every corner. 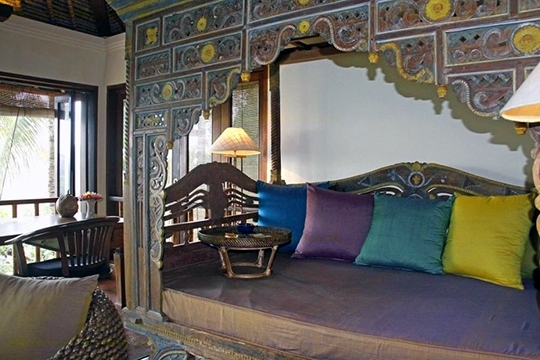 There’s a choice of seating areas furnished with antique chests, batik cushion-covered daybed, planters chairs and objets d’art. Behind an elaborately carved wooden screen beyond the dining area (comprising two square teakwood tables with seating for six) is the well-equipped western-style kitchen where Nengah the cook whips up much admired local and western meals. 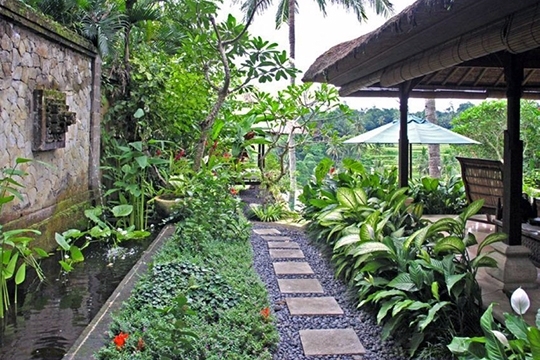 Two oversized wayang kulit-style wooden carvings flank steps leading down to the garden terrace where a large infinity-edge swimming pool appears seemingly suspended at the very edge of the gorge. A teakwood table shaded by a parasol invites alfresco dining, and sun loungers and a pool-edge balé (gazebo) invite indolence. The garden, while small, adds splashes of colour with frangipani, cordelines and heliconia. 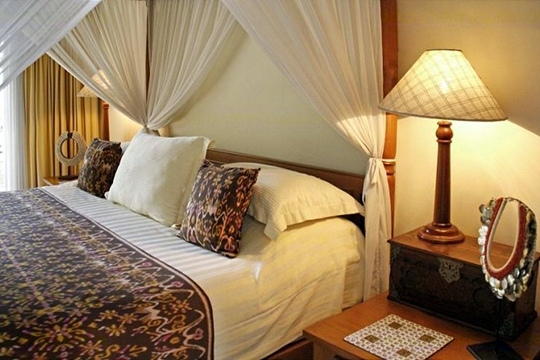 By the entrance gate are staff quarters and a room equipped with treadmill and bicycle. 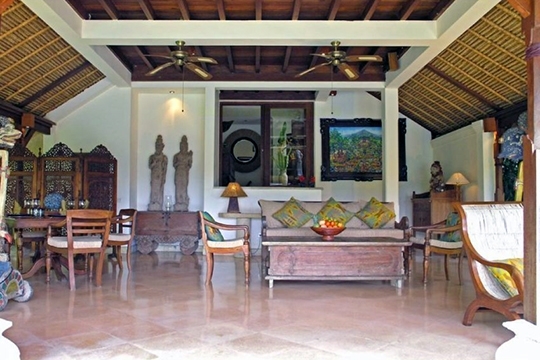 2 bedroom villa located in Ubud, Bali. Ideal for The great outdoors, Romantic retreats, Room with a view.